As a key part of Louisiana culture, Cajun/Creole cuisine is a natural addition to any tourism event presented by the state. 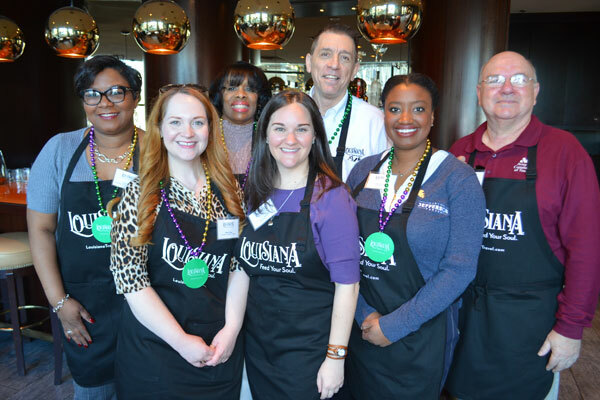 Louisiana state officials and destination suppliers took that to next level during a recent visit to Vancouver, by inviting guests to participate in the cooking chores themselves. A group of nearly 20 tourism media and bloggers met at the Pacific Institute of Culinary Arts near Granville Island where they donned aprons and joined chefs in three large teaching kitchens. There, under watchful directions, they prepared a lunch consisting of a shrimp/apple remoulade, blackened catfish and pain perdu for dessert. Yum! While dining on these dishes, guests got some of the latest tourism news from the various regions around the state. For instance, the New Orleans Plantation Country region has a host of events, festivals, plantation tours and swamp excursions for 2019, demonstrating that New Orleans itself is not the only attraction in the state. The Evergreen Plantation is the most intact plantation complex in the South, with 37 buildings on the National Register of Historic Places. Visitors can plan their visit to Plantation Country around events like the Sings and Strings Festival in April, the Louisiana Catfish Festival in June, and the Andouille Festival in October. Other attractions and events are featured in these River Parishes, or counties, located just west of New Orleans on the Mississippi River. The Louisiana tourism mission also made a stop in Calgary, where a dinner event for travel agents was presented. This was the first time that tourism reps from Louisiana had visited Calgary, and about 70 agents came out for the dinner, which was held at the Calgary Marriott Downtown. A lunch for Calgary media was also scheduled, and it was held at Cuisine et Chateau. Pictured, tourism destination and attraction reps from Louisiana included (back row l-r) Erica Telsee, Shreveport-Bossier CTB; Willma Harvey, New Orleans Plantation Country; Mike Prejean, Louisiana Office of Tourism; Wilbert Carmouche, Atchafalaya National Heritage Area. In front are (l-r) Marie Stagg, Louisiana Office of Tourism; Kaylee LeBlanc, Lafayette CVC; and Paris Vinnett, Jefferson CVB.